The power of moral sanction is central to rebuilding democratic society. An examination, therefore, of the strengths and weaknesses of this tool of social change is warranted. Moral sanction alone may be insufficient to constrain political violence or official repression, but it can bring significant pressures to bear on public behavior, as well as within institutions under the control or influence of civil society. Indeed, both reform and revolutionary movements, as well as all forms of resistance in fundamental conflict with tyrannical powers, rely on moral sanction as an essential component of warfare. Resistance warfare may take multiple forms: war of position, based on a principle (i.e. boycotts); war of movement, uniting affinity interest groups (i.e. strikes); civil disobedience, to garner attention to an issue or recognition of the aggrieved; underground warfare, to subvert illegitimate authorities (i.e. sabotage); or open conflict, to challenge the police powers of these authorities (including riots and armed insurrection). The psychological warfare, the war of ideas, and the war of maneuver are constant; those committed to and capable of seizing power must thus continue intelligence and self-defense activities in anticipation of future attack. Leaders are well-advised to methodically prepare themselves, their followers and allies for the eventuality of attack and counter-attack. The degree of commitment and courage among their supporters will vary greatly, ebbing and flowing with the tumultuous circumstances of conflict. Oppressive regimes and ideologues are well-versed in the use of fear, hate, and revenge as a formula for undermining and destroying opposition. Dissent without resistance, it should be noted, is a form of consent. If official acts offend our sense of decency, moral sanction must be exercised, or one’s words have no meaning but to flatter one’s sense of piety. Human dignity, integrity and justice cannot be obtained without accountability. Thus there are distinct limits to a strategy of moral theatrics in containing such things as the neurosis of militarism and the pathogen of aggression; at some point, risks must be taken to curtail systematic global violence. In the case of modern conflict tactics, like civil disobedience or resistance (sometimes referred to as direct action), repeated exposure to severe official reaction helps to make patterns of oppression recognizable. It is at this point that individuals become potential recruits to a community of socially-based participants engaged in experimenting with moral sanction. The clarity of argument for moral sanction against aggression is most pronounced in the case of classic colonialism, where a foreign power occupies the territory of another people. 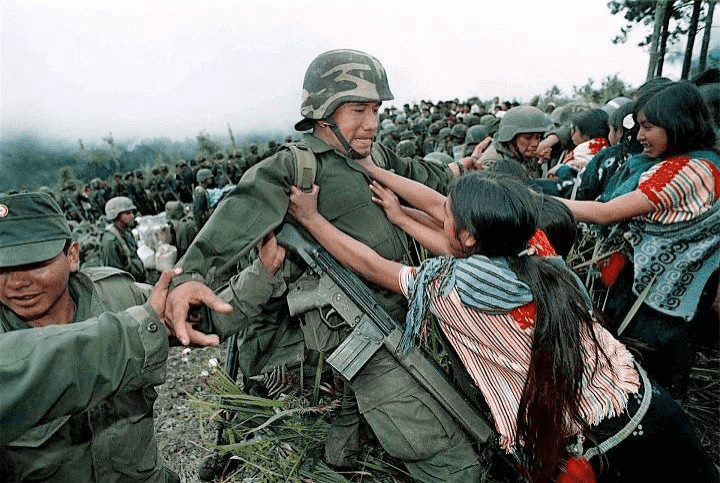 It is less clear in the case of neoliberal economic colonialism that often relies on economic penalties and paramilitary forces to suppress the fulfillment of social needs. But it is most obscured where the descendants of colonists, through the passage of time and consolidation of control, manage to assuage their collective conscience regarding their inherited privilege. The dissonance of conscience provoked by this self-delusion is most dangerous when confronted with the reality of resistance by those deprived—particularly when the violated claims of Indigenous populations are codified by statute and treaty, as they are in the US. The determination of American Indians to reclaim their heritage–their right to exist as a people and culture–has never wavered. Empowered by their knowledge of history and overarching relational values of integrity, they have persistently awoken a moral position in our conscience.